This animated series finds the Abh Empire at the end of a protracted but successful war. The wounds inflicted by constant combat have taken their toll, though, and everyone's struggling to recover their footing in peacetime. Captain Lafiel's been put in charge of the Lobnas II territory, a former colony of ex-convicts that's far from ready to accept harmony. It appears that the serenity the empire has fought so hard to attain may now be in peril. 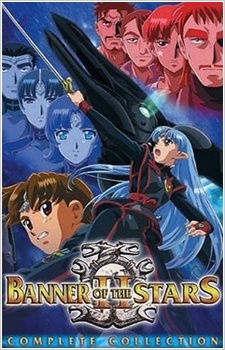 Watch Banner of the Stars II Episodes Online at Animegg.org. Banner of the Stars II is available in High Definition only through Animegg.org. Choose an episode below and start watching Banner of the Stars II in Subbed & Dubbed HD now.